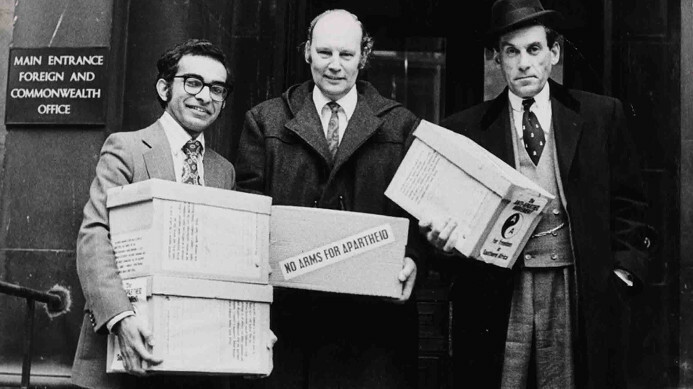 AAM Secretary Abdul Minty, Chair Bob Hughes MP and Liberal MP Jeremy Thorpe deliver a ‘No arms for apartheid’ petition to the Labour Government on the anniversary of the Sharpeville massacre, 21 March 1977. The Anti-Apartheid Movement lobbied Labour and Conservative governments directly, as well as building a mass movement to change government policy. It sought meetings with ministers, raised issues in letters and memoranda, and gave evidence to parliamentary inquiries. It submitted detailed evidence of breaches of the arms embargo and proposals as to how it should be strengthened. It pressed for the implementation of the 1977 Commonwealth Gleneagles Agreement on sporting contacts with South Africa when the Conservative government failed to honour it in the 1980s. It pressed the British government to intervene with South Africa to stop Mandela and his comrades being sentenced to death in the Rivonia trial. Later it asked the government to urge clemency in every case where the death sentence was imposed in a political trial. It ensured that the British government intervened on behalf of the Sharpeville Six and the Upington 14. Its constant pressure contributed to Prime Minister Margaret Thatcher’s change of attitude on the release of Nelson Mandela. In the 1980s undercover South African agents bombed the London office of the African National Congress and burgled the headquarters of the AAM and other anti-apartheid organisations. A delegation from the AAM met the Home Secretary and made specific proposals for ending illegal activities sponsored by the South African Embassy. From its formation the AAM asked the British government to support UN moves to end South African control over Namibia. In the 1980s it argued that Britain should dissociate itself from the US policy of linking the withdrawal of Cuban military personnel from Angola with progress towards Namibian independence. In meetings with ministers and memoranda it argued for economic sanctions and disengagement from South Africa. In the difficult years of the early 1990s it urged the government to press President de Klerk to end the violence in South Africa and agree to a constitution that provided for one person one vote in a united South Africa. 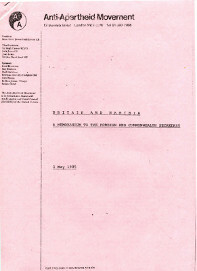 Memorandum arguing for a review of British government policy on Namibia. 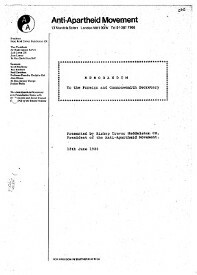 AAM memorandum arguing that British and US policies were the main obstacles to effective international action against apartheid. 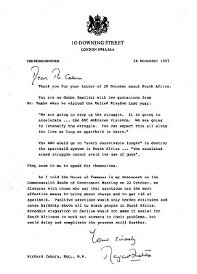 Letter from Prime Minister Thatcher defending her description of the ANC as a ‘typical terorrist organisation’ and reiterating her opposition to sanctions.